Easy Florida Moving is a licensed and insured moving company. We have operating athority from Federal Motor Carrier Safety Administration MC-57089 as an Interstate Houshold Mover. Florida Department of Agriculture and Consumer Services issued to Easy Florida Moving LLC a Registration Number IM2901 as an Interstate Mover of Household Goods, as required in Florida by Chapter 507, Florida Statutes. 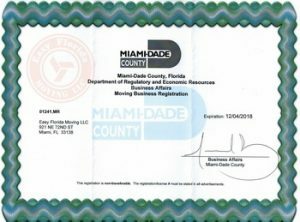 Miami-Dade County, Florida, Department of Regulatory and Economic Resources Business Affairs has issued a Registration Number MR01241 to Easy Florida Moving LLC, as a local Mover. You can be sure that your belongings will arrive clean and on time. Since we started working, you’ll be given a direct number of representative who will take care of your concerns immediately. We do not charge extra for excellence, it’s included in our basic package. With the years of experience we’ll make your relocation easy and affordable. With all the respect to our veterans and senior people, we are always have our special rates. Started just in 2017 Easy Florida Moving has gained a true recognition among its clients. Because we value of our name and want you to reffer us to your friends and family. Every single item we move, is taken great care of. Because we understand how it’s important to move into a new housing and feel no stress of seeing any damages or lost.